ROMAN EMPIRE. VALERIAN I, AD 253-260. 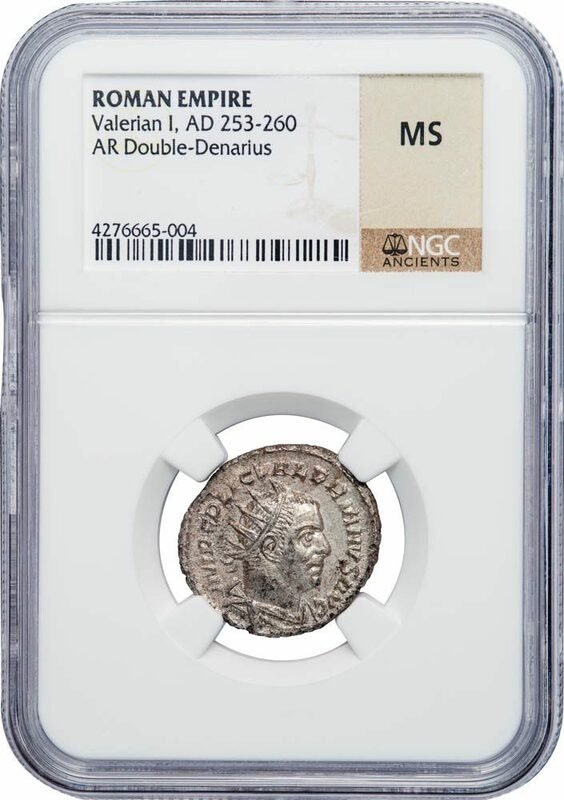 Silver Double-denarius ( Antoninianus ), emission of Antioch, AD 253-54. Obv. Radiate, draped and cuirassed bust right. Rev. PACATOR ORBIS, Jupiter enthroned left, eagle at his feet. NGC net graded MINT STATE. Valerian was captured on the field of battle against the Sassanian king Shapur I. He was taken prisoner and died in captivity. Valerian’s defeat and submission is celebrated in the well known reliefs at Naqsh-e Rustam.